Covered in detail by The Register recently, Buzzfeed and the creators of Unbaby.me have developed a new Chrome extension to help people avoid endless political posts on Facebook and Twitter as the 2012 Presidential election rapidly approaches on November 6. While the previous Firefox and Chrome extension Unbaby.me replaced all baby photos on Facebook with images of bacon, puppies and art among other things, the Chrome-only Unpolitic.me extension replaces the majority of political posts on Facebook and Twitter with various pictures of cats. While Facebook does provide filters to help users avoid updates from specific Facebook friends, this type of application can be particularly helpful for anyone that’s tired of hearing about politics. It allows the Facebook user to avoid political posts, but still read other interesting updates about friends, family and activities from politically outspoken friends. The Unpolitic.me extension works by actively scanning a user’s social media feed for mention of specific keywords related to politics. While the user has the option of adding any specific keyword into the mix, a large number of default keywords have already been selected for the user. For instance, the creators of the extension have added “Romney, Obama, election, voting for, republican, democrat, Ron Paul, 47 percent, binders, debate, how messed up is this country, Biden, Paul Ryan, Akin, Scott Brown, Elizabeth Warren, abortion, romnesia” along with 30 other keywords to help identify political posts. In addition, the user of the Unpolitic.me extension has the ability to use any image-based RSS feed. 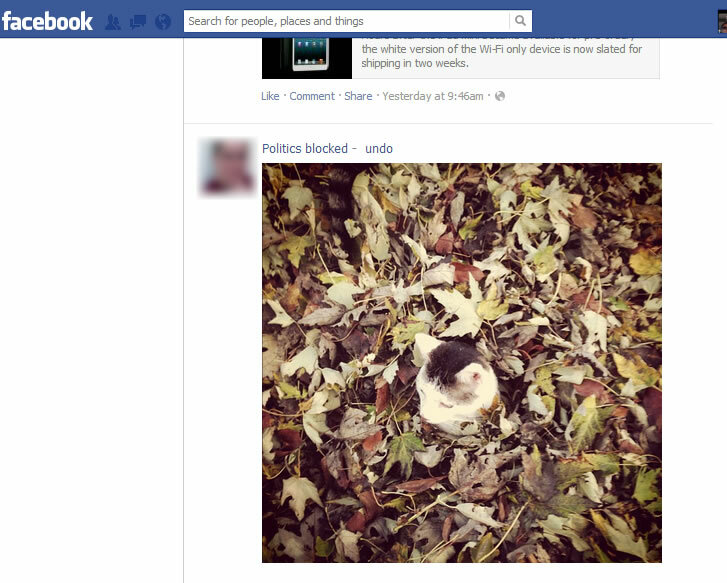 The creators of the extension have set the default as a stream of cat pictures from Instagram users. However, the user of the extension can change the RSS feed to anything else in addition to adding more feeds into the mix. There’s no reason that a usr has to stick with cat pictures. For instance, someone that likes all types of cute animals could add more image streams of puppies, panda bears and bunnies. The makers of the extension recommend using RSS feeds that provide large resolution pictures. In addition, there’s no limit to the number of RSS feeds that a user can choose to use. The Unpolitic.me extension will randomly pull from those feeds and replace the content on the page. 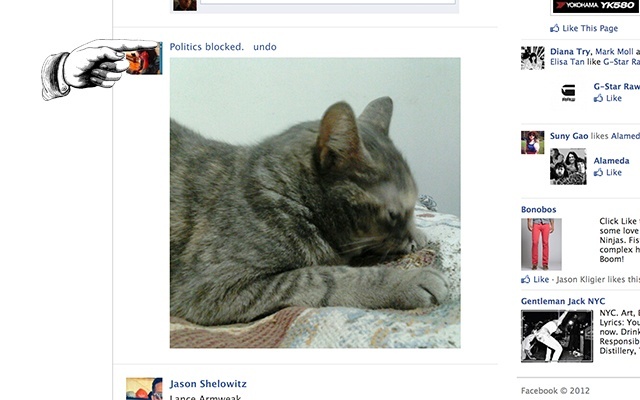 On Facebook, a post about politics is simply replaced with the phrase “Politics blocked” and the replacement image. There’s also a link to remove the image if the user really wants to see what was originally posted. On Twitter, the user also has the ability to undo the content block. 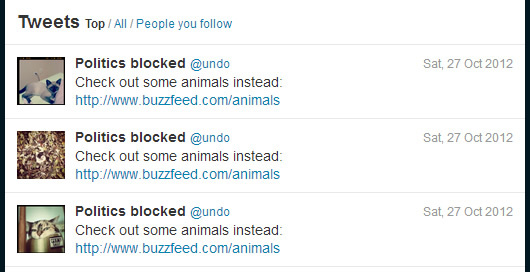 However, Twitter users will see a link to Buzzfeed’s animals section rather than a photo pulled from the RSS feeds chosen by the user. Conceptually, the Unpolitic.me extension can be used to block any type of content found on Facebook or Twitter. If a user doesn’t like a particular organization, any posts about said organization can be blocked by adding a few keywords in the settings of the extension. However, the extension can only block posts that include words. For instance, if a Facebook friend posts an political meme without adding a description, the person using Unpolitic.me will still see the political post within their Facebook feed.